Sundays are typically my lazy day. This is one of the reasons I chose to do Soup Sundays on Sundays. I don’t have to typically invest a lot of time into soups, which makes them perfect for Sundays. I also love Soup Sunday because soups tend to be lower in calorie, so they are perfect for “rest days.” There are a few soups I keep on regular rotation. This happens to be one of those soups. 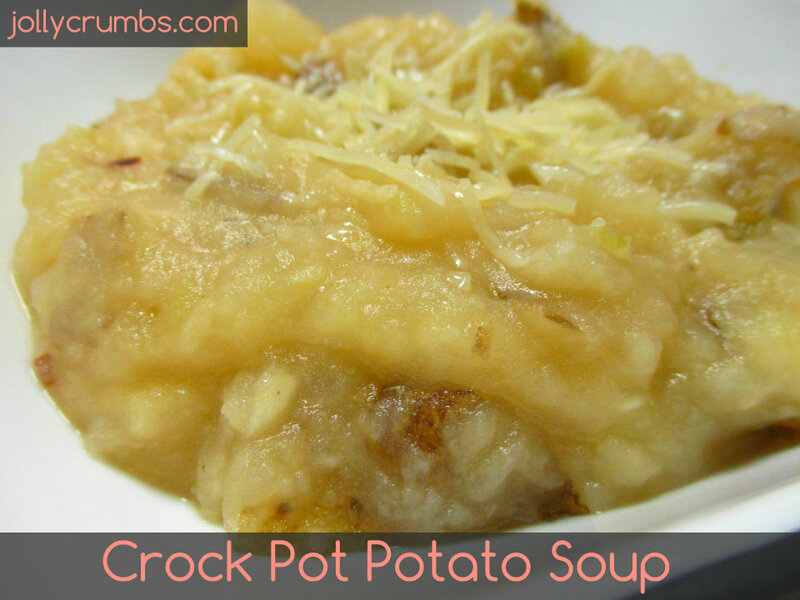 This crock pot potato soup is amazing. I have been making it for a couple years, and I have never had it turn out bad. It’s so easy. The crock pot does the major work, which makes it all the better. The only real work you have to do is chop the vegetables and mash the potatoes at the end of the cooking. That’s it. There is no cream or milk required to make this recipe. I use margarine in this recipe, but you could use butter if you prefer. I have made it with butter, and it does not taste any different with margarine. Feel free to add whatever toppings you’d love for this soup. It is honestly the best potato soup I’ve had. This will be on your recipe rotation, I guarantee it. In order to make the soup, you first have to chop up your veggies. I like to keep my potato chunks roughly the same size so they cook evenly. Try to keep them around ½ inch cubes. 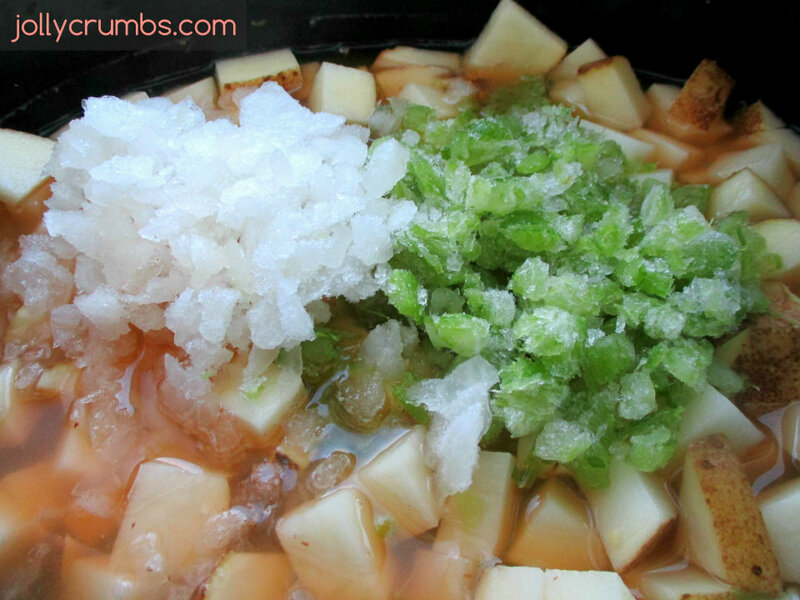 For the onions and celery, dice them finely so they soften easily during cooking. Just throw all the vegetables into the crock pot. 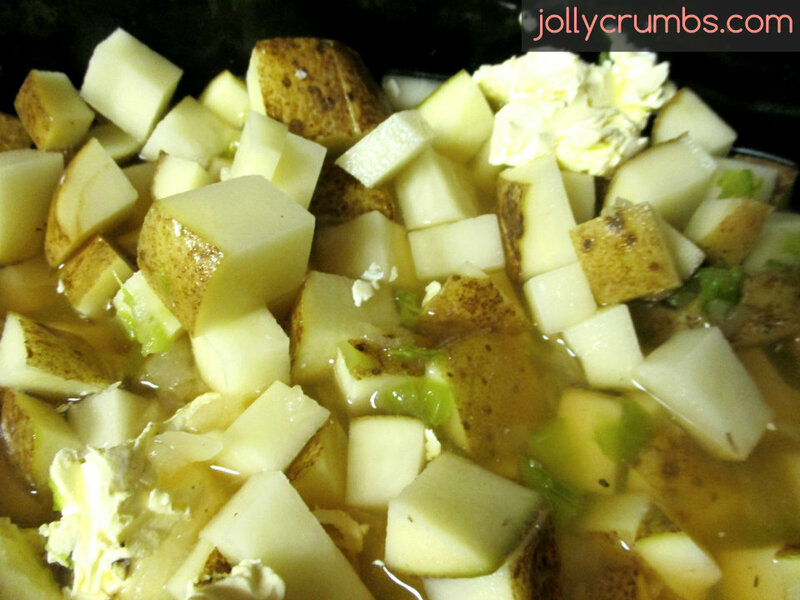 Next, add the vegetable broth, garlic, margarine, salt, and pepper to the veggies in the crock pot. Now you have a couple choices for cook time. You can either cook the soup for 4 hours on HIGH or 8 hours on LOW. I have made this soup both ways, and it is equally delicious whichever setting you decide to use. I have never been able to notice a difference in flavors between the 4 hours and 8 hours. So set your crock pot for whatever suits your needs. 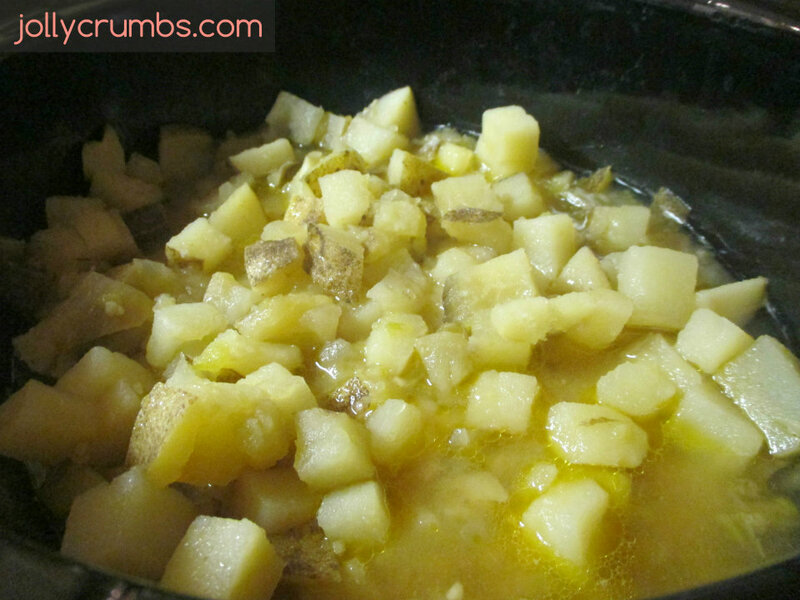 After the soup is done cooking, use an immersion blender or potato masher to mash some of the potatoes. You don’t want to mash all of the potatoes or you will end up with a thick soup, similar to mashed potatoes. I use a potato masher and just mash part of the potatoes. I like to have both chunks of potato and smooth potatoes in the soup. Mix in the shredded and grated cheese and spices until smooth. As usual, I prefer to grate and shred my own cheese. However, pre-grated Parmesan cheese works just fine in this recipe. I did grate my own extra sharp cheddar from the block though. It melts much better than pre-shredded cheese. Season to taste and serve with any toppings you’d like. This soup has been in my regular recipe rotation for about 2 years now. It is an instant favorite. I have shared this recipe with my mom, and she has made it several times since then. You can experiment with the spices and cheeses, which makes this soup very versatile for any family. This soup is very hearty and filling but also low in calorie. The crock pot does all of the hard work, and it results in an out-of-this-world soup. This is the ultimate potato soup, and it is sure to please anyone. Chop your veggies and toss them into the crock pot. Add vegetable broth, garlic, margarine, salt, and pepper. Set your crock pot on HIGH for 4 hours or LOW for 8 hours. The potatoes should be tender and soft. After cooking, use an immersion blender or potato masher to mash some of your potatoes. Don’t mash all the potatoes, or it will become very thick. Mix in the cheese and spices until completely melted. Season to taste with additional salt, pepper, or garlic powder. I like to partially mash the potatoes in the soup. I like it somewhat chunky and blended at the same time. I once mashed it so much it became similar to mashed potatoes. So just be careful when you are blending or mashing the potatoes. Less is more!